Ashley Burrows (‘18) attempting to lay down a bunt. 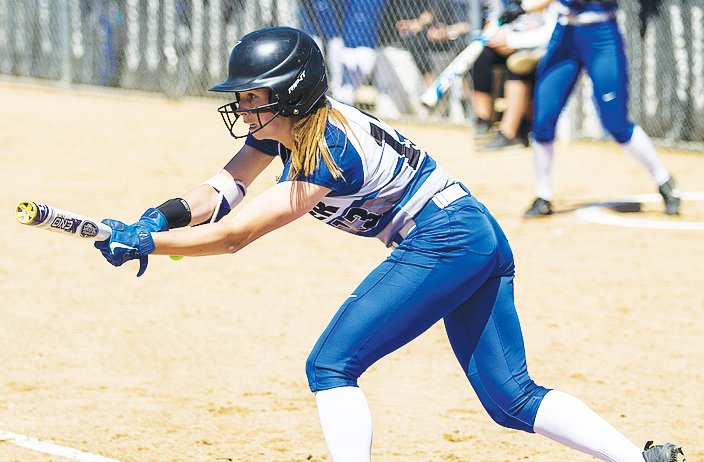 Luther Softball hosted the IIAC Tournament Championships on May 5-6 and won the championship for the third year in a row with a walk-off single in the bottom of the ninth. The Norse defeated the Wartburg Knights in the semi-final 5-1, scoring four of the five runs in the fifth inning. Offensively, infielder Natalie Stockman (‘18) led the Norse with three runs batted in. Outfielder Ashley Burrows (‘18) and outfielder Sara Nelson (‘17) scored two of the five runs for the Norse in the fifth inning. Defensively, pitcher Samantha Bratland (‘19) allowed only one run on seven hits, walked two batters, and struck out a season best of 12 hitters. The semifinal win advanced Luther to the second day of tournament play against Central College. In the tournament finals, the No. 3 Norse faced No. 10 Central College. The Norse won with a score of 4-3 in nine innings. Pitcher Anne Versnik (‘17) started the first two innings, allowing just two hits. The Norse then brought in Amanda Witzlib (‘17) who pitched five innings, allowing only two runs on eight hits. Bratland came in as the relief pitcher and ended up getting the win, allowing one run on three hits. The Norse were losing 3-2 going into the bottom of the ninth inning, but were able to load the bases before Anna Strien (‘18) tied the game on a sacrifice fly that scored pinch runner Lilly Johnson (‘20). With runners on first and second base with one out, Stockman singled, scoring Burrows in a 4-3 walk-off victory for the Norse. With that win, the Norse became 2017 IIAC Conference Tournament Champions. The team has shared many wins and losses together, but this season has been meaningful to many of the players, including Witzlib. According to Stockman, the Norse created a simple game plan for the tournament. Witzlib also commented on the team’s mindset going into the games. At the end of the day, the Norse success was due to the team’s chemistry. Stockman commented on the high level of competition in the tournament. This is the third year in a row that the Norse have won the IIAC Tournament Championship, and it is the sixth title they have won in eight years. With this win, the Norse will advance to play in the NCAA III Regional May 12-14.